Squirrel Appreciation Day: These Cats Are Obsessed With Squirrels! We all know just how much dogs love to chase after squirrels. But in honor of Squirrel Appreciation Day, which falls on January 21st of every year, let’s take a closer look at the hilarious way that cats are also fascinated with these bushy-tailed creatures. Check out these five videos of felines who are absolutely obsessed with squirrels. There’s a whole lot of good stuff going on here: We have a snowstorm and a squirrel on the outside, while Dermot the cat is safe and warm inside his house. What ensues is some particularly rigorous bouncing and hopping around from Dermot as he attempts to get up close and personal with the squirrel. Next up, we have a feline and squirrel interaction that’s all about a slow and stealthy stare down. Check out how our friend Kit Kat skillfully stalks the squirrel before she decides it’s not worth pushing her luck with the beast and scurries off, instead–probably to take a well-earned nap. At this point, you might be forgiven for thinking that squirrels are openly taunting cats who are shielded behind glass doors. Witness how these two felines are being positively mocked by their squirrel neighbor! Actually, it seems that squirrels are just as prone to taunting cats when all parties are out in the wild. Watch how this bushy tailed tyke makes a mockery of two–count ’em!–felines as they play hide and seek in a tree. 5. Who’s Got The Treats? Is this fine feline obsessed with the squirrel outside her window due to her natural predatory instincts? Or simply because the squirrel has a treat to snack on and she doesn’t? Does your own cat go crazy for squirrels? 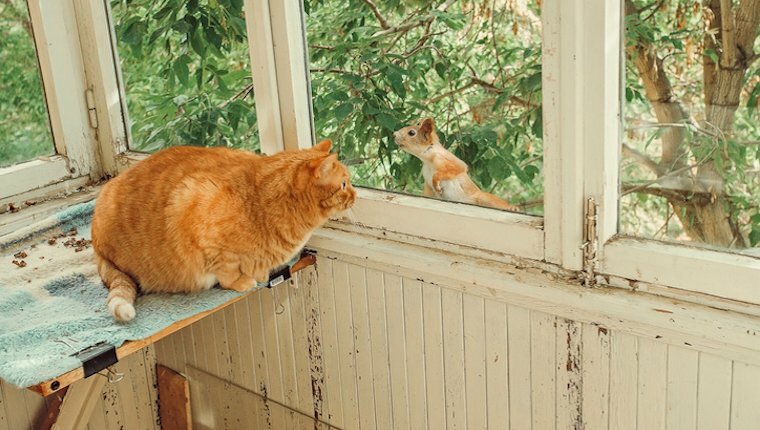 Will your cat be on the lookout on Squirrel Appreciation Day? Tell us all about it in the comments below!